DEATH TO THE BUHARI REGIME IN ABUJA. The depth of depravity that unfolded at Sheikh Ibrahim al-Zakzaky’s home in Zaria from December 12th-14th, 2015 will probably never be fully uncovered. Thousands of murdered and wounded, with the dead being buried under the rubble of the Sheikh’s house and the Husseiniyah Baqiyatullah which were razed to the ground in the US-‘Israeli’-Saudi-backed Nigerian Armed Forces’ savage raid. 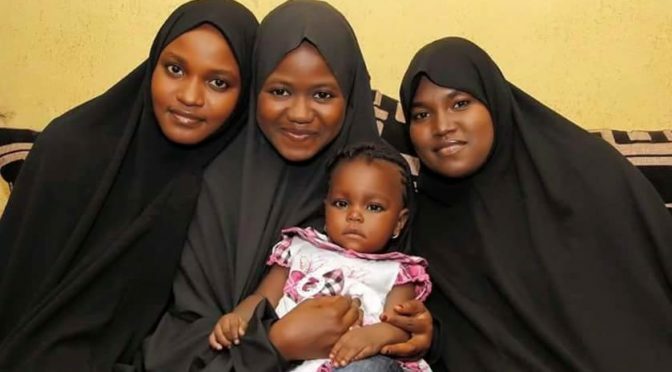 The three beautiful young women and the absolutely adorable little girl pictured here are the niece (A’isha), 18-month old grandniece (Fatima-Batoula) and the two daughters (Nusayba and Fatima) of Malam Abou Bakr Zaki, Sheikh Ibrahim Zakzaky’s deputy in Gwagwalada. The heartbreak this man is experiencing, despite being a Khomeiniist-Husseini lover of martyrdom and Ahlul Bayt (A.S.), must be unfathomable–even Imam Zayn al-Abideen (A.S.) is said to have cried everyday for 20 years straight after what happened in Karbala on Ashoura–as all four of these angels plus A’isha’s husband Buhari Bello Jega were slaughtered in the Zaria Massacre by the monstrous, malicious, Zionized Nigerian army. Knowing the connections the cancerous ‘Israelis’ have to the Nigerian security apparatus–indeed it is a Mossad-CIA taskforce initially set up by former Zionist ambassador to Nigeria Moshe Ramwhich are running the military-intelligence show in the oil-rich African state–it’s impossible to stop the comparisons that come to mind when gazing at these four daughters of Lady Zaynab (A.S.), these angels who were taken from this Earth by demons too soon. I look at them and see 13-year old Palestinian Iman Darwish al-Hams, insanely shot 17 times by ‘Israeli’ terrorists in Rafah on October 5th, 2004. I look at them and see 14-year old Iraqi Abir Qassem Hamza al-Janabi, raped and murdered along with her whole family by the occupation forces of the American ZOG in Mahmoudiyah on March 12th, 2006. I look at them and see the Lebanese children of Marwaheen, massacred by a Jewish supremacist entity helicopter gunship on July 15th, 2006. I look at them and see 12-year old Yemeni Tayseer Okba, murdered by the Dönmeh House of Saud in an air strike as she went to visit her grandmother in Sanaa on September 12th, 2015. I look at them see each and every victim, male or female, child or adult, all throughout the Islamic world slaughtered directly by World Zionism or indirectly by its proxies.